Since I was back at work and working days last week that meant a lot more opportunities to see how the markets were doing and search out potential option plays. I'm a bit overextended right now from where I'd like to be in my Rollover IRA so this week will probably see much less action. At least until I can take some positions off to free up some more capital. Without further ado, let's get onto the moves from last week. When I opened this position up Flowers Foods' share price had just fallen pretty large after reporting earnings. I opened up a slightly ITM put contract with the idea that the share price would recover back above my strike allowing me to keep the full option premium as profit. That didn't exactly work out right and since I don't really want to own Flowers Foods I closed the contract out before expiration and locked in a small gain. This contract provided a net profit of $29.91. While that may not seem like much it was still a 1.50% return on the $2,000 at risk to secure the contract. The annualized return came to 23.2%. I was only able to capture 25% of the maximum profit in 90% of the days until expiration, but that's fine by me because it released that capital and my obligation to potentially purchase shares. If I had paid a little bit closer attention to the dividend/earnings/call potential set up I might have just let this one go all the way until expiration. But whenever I open new option positions I typically set up good til cancelled limit orders at a price that would net me a good profit. This contract provided a net profit of $66.91 which is a 0.61% return on the $11,000 securing the contract. The annualized return worked out to a not too shabby 27.9%. I was able to lock in 69% of the maximum profit in just 38% of the days and release that capital. The covered strangle is one of my go to strategies within my Rollover IRA whenever I have shares put to me. 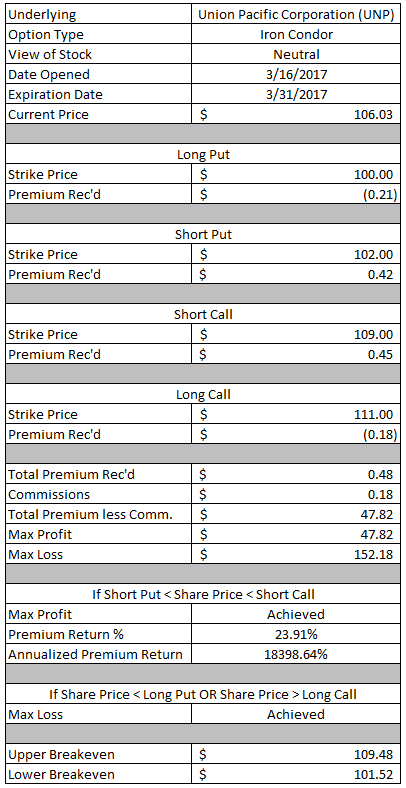 Since you're selling both a put and call option the total premium is higher than if you just sold one side. That comes with the risk of having to double down on the position, but that's a risk I'm willing to take since I'm flush with cash in that account. This covered strangle produced a net profit of $82.82. Based on the additional $7,850 of capital securing the put portion of the position that's a 1.06% return or 34.3% annualized. I was able to capture 72% of the maximum profit in just 54% of the days until expiration. Closing this covered strangle out allowed me to open up a new position as you'll see later. Just over a week ago news broke that some employees at Toronto Dominion Bank (TD) were pressured to sell customers products/services even if it wasn't in their best interest. I'm not sure if it's as bad as Wells Fargo's (WFC) scandal that included accounts being opened without the customer's permission, but Toronto Dominion's share price fell over 5% on the news. Personally I think this is much ado about nothing because every...single...person in sales is under a lot of pressure to meet sales figures/quotas. As long as there wasn't any fraudulent activity going on this is nothing except for an opportunity for long term investors. If Toronto Dominion's share price remains below $50 then I'll have to purchase 100 shares at an effective purchase price of $48.75. That's around a 2.2% discount from where shares were trading at the time I opened the position. 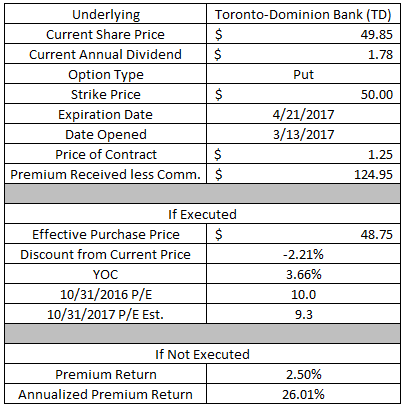 If Toronto Dominion's share price rebounds back above $50 then the put contract will expire out of the money and I'll get to keep the full option premium as profit. The $124.95 in option premium would be a 2.50% return on the $5,000 of capital securing the position or a 26.0% annualized return through expiration. Depending on how things go I might open up a second put option on Toronto Dominion Bank or purchase shares outright. The Canadian banks have a storied history of paying and growing dividends. TD's current yield is around 3.6% and that's with the negative currency exchange for US investors. Even if the FX rate stays where it is TD looks attractive with 5-7% annual dividend growth and there's a FX kicker should the exchange rate revert to near parity potentially providing an additional 25%+ boost to US investors' dividend income. This is a new one for me, but I wanted to take a bit of a chance on a company that has been beaten down. Of course, my confidence in the company continuing on is boosted by the fact that the dividend was recently increased 36%. If Hanes Brands' share price falls below $20 at expiration then I'll have to purchase 100 shares at an effective purchase price of $19.40. The YOC at that level would be 3.09% and the valuation would be quite attractive at just 10.5x trailing FY earnings and 9.9x forward FY earnings. My effective purchase price would be at a 4.3% discount to the share price when the contract was opened. If Hanes Brands' share price remains above $20 at expiration then the full option premium will be profit. The $59.95 of option premium would be a 3.0% return on the $2,000 of cash securing the position. That's a 32.8% annualized return if held through expiration. Since Hanes Brands is set to release earnings on April 20th there likely won't be too much to do with this contract until expiration. I hate to lock up the capital for that long, but since I'm flush with cash in my Rollover IRA and I can generate a 3.0% return I'm okay with setting this cash aside. For those with a good memory I already have a put option on Pfizer that expires on April 7th. So I doubled up a bit by selling a slightly out of the money put contract that sets up well for bringing in additional premium via call options should this one expire in the money. If Pfizer's share price falls below $34 by expiration then I'll have to purchase 100 shares of Pfizer for an effective purchase price of $33.54. The valuation there looks pretty good at 14.0x trailing earnings and 13.2x current year estimates. The YOC at that level would be 3.82% and would be at a 2.3% discount to the current share price. If Pfizer's price remains above $34 at expiration then I'll get to keep the full option premium as profit. The $45.95 would be a 1.35% return on the $3,400 of capital required to secure the contract. Through expiration that would be a 12.4% annualized return. Pfizer is looking like a pretty good value at these levels although if both of my put contracts on Pfizer end up ITM then I'll own 200 shares of the company. That's a bit heavier than I'd like to be; however, Pfizer has earnings coming out around May 2nd which will allow me to then sell calls against one or both positions and collect a hefty option premium. I'm going to run through this position fairly quickly since I doubled up on Mastercard by opening a second put option this week as well. If Mastercard's share price falls below $111 at expiration then I'll have to purchase 100 shares at an effective purchase price of $110.46. The valuation is a bit stretched at these levels; however, Mastercard should be able to grow into that valuation rather quickly. On a trailing basis my purchase price would be at 29.3x earnings and based on the estimates for the current year the valuation would be 25.9x. If Mastercard's share price remains above $111 then I'll get to keep the entire $53.95 of option premium as profit. That would represent a 0.49% return on the $11,100 of capital securing the contract or 12.5% annualized through expiration. You can see my reasoning for doubling up on Mastercard after my explanation of how this option can go. If Mastercard's share price falls below $112 then the put contract would be in the money and I'd have to purchase 100 shares at an effective purchase price of $111.33. The purchase price would be at a 1.3% discount from the current price. If Mastercard's share price remains above $112 then I'll keep the full option premium as profit. The $66.95 of option premium would be a 0.60% return on the $11,200 of capital necessary to secure the contract. Through expiration that would be a 16.8% annualized return. I'm quite bullish on both Visa (V) and Mastercard because they're the quintessential "toll road" companies. They don't carry the credit risk that consumers take on, but just take a small fee in order to facilitate the transactions. If both of these put contracts end up in the money that's just fine by me even though Mastercard would by far be my largest position. My thought process is that if these get assigned to me I (1) was able to purchase them for cheaper than the market was current offering them for, (2) would collect the next quarterly dividend of $0.22, and (3) would be able to write call contracts on both positions with juiced up premiums due to earnings on April 27th. 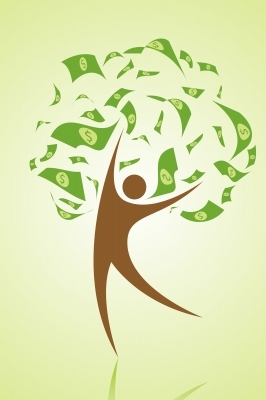 Everything is set up nicely to generate some good option premium or capital gains as well as collect the dividend. This works well in my Rollover IRA since I don't have to worry about taxes although it's something I'd consider for my taxable account if I had the available cash. Of course "the best laid plans of mice and men often go awry". The big risk that I'm taking is that Mastercard's share price moves significantly lower between now and the end of the month. Since we're after the FOMC meeting I don't see a whole lot on the radar that could potentially trigger a selloff especially since Mastercards earnings aren't due out until April. So essentially it's a risk I'm willing to take and if I own 200 shares of a company that has a realistic chance to grow earnings, cash flow and dividends at 10%+ for the next decade, well, so be it. I didn't waste any time with getting a new covered strangle position on in CVS and opened this one the same day that I closed the other one. If CVS's share price falls below $78.50 then I'll have to purchase 100 more shares in the company at an effective purchase price of $77.50 or a 3.3% discount from where CVS' shares were priced at the time the position was opened. Since I already own 100 shares at a cost basis of $83.20 the new lot would reduce my overall cost basis to $80.35. If CVS' share price rises above $83.50 then I'll have to sell the 100 shares that I currently own. My effective sale price would be the call strike of $83.50 plus the total premium received $0.999 giving me a sale price of $84.50. That would be a 1.56% return on my position or 20.0% annualized for the duration of the contract. 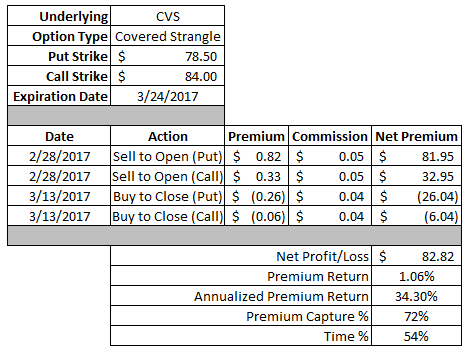 Ideally CVS' share price will just stay between the $78.50 and $83.50 strikes of the put and call, respectively. In that scenario I'd get to keep the full option premium as profit. The $99.90 of option premium would be a 1.27% return on the $7,850 of additional capital at risk or 16.1% annualized. Over the last 2 weeks I've been trying out strategies to be more efficient with my capital by opening up a few spread positions. The spreads reduce your risk to the width of the spread, but that also comes with the tradeoff of lowering the profit. Although your return on capital shoots way up compared to the cash secured puts that I normally use. The maximum profit that I can make on this spread is the credit received or $44.91. The maximum risk is the width of the spread, $2.50, less the credit received or $205.09. The maximum profit will be achieved if Visa's share price remains above the $87.50 strike of my short put option. In that scenario both contracts would expire out of the money. The $44.91 credit would be a 18.0% return on the $2.50 width of the spread. The maximum loss on this spread will occur if Visa's share price falls all the way below the strike price of my long put option or $85. In that scenario I would lose the $250 for the width of the spread less the $44.91 credit I already received bringing the maximum loss to $205.09. After skimming through Warren Buffett's latest shareholder letter one thing popped out at me and that was that he explicitly wrote that not all of his investments are "forever" stocks. This was in the section where he was talking about his big long term positions and I couldn't help but try and read through the tea leaves there about which company he was referring too. The 3 that came to mind were American Express, Wells Fargo (due to the fraudulent account issues) and Coca-Cola. When you couple that statement with Coca-Cola's struggles as well as Howard Buffett leaving Coca-Cola's Board that spooked me a bit. My general feeling is that Coca-Cola is trading at a large premium to where it would be at if no one knew that Buffett had such a large stake in the company. Essentially I think there's at least a 10-25% "Buffett premium" attached to Coca-Cola's valuation. I might be reading way too much into his statement, but it was something I wanted to protect myself against which meant the costless collar was something to look into. The costless collar is created by selling an OTM call option and then buying an OTM put option with the premium received from the call. The costless collar is a neutral strategy where your upside is capped, but you also limit your downside risk. 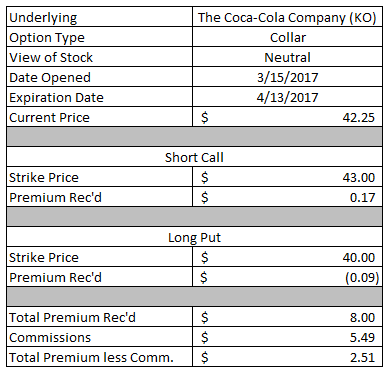 If Coca-Cola's share price stays within the 2 strikes, $40.00 and $43.00, then I'll get to keep the small $2.51 of excess premium as profit. Although that's not really the spirit of the costless collar. I'm willing to sell my shares at $43, but I wanted to limit my losses in case the share price falls below $40 in the event we get a Buffet related valuation crunch. I don't necessarily expect it to happen, but if it does I expect it'll be quick. Buffett's next 13F filing should be released sometime in mid-April, around the time of Coca-Cola's next earnings release. 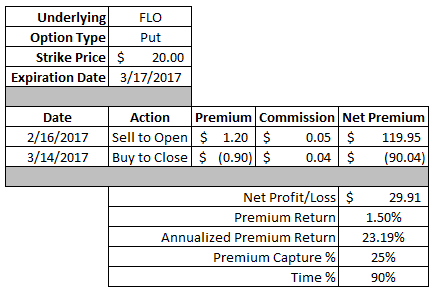 Using the delta's of these options as a probability gauge the call option has a 0.26 delta and a the put option was at -0.10. The probabilities are saying there's a (0.26 + 0.10) = 0.36 = 36% chance of either of the contracts expiring in the money and therefore a 64% chance of both expiring out of the money. To go along with adding some put and call spreads into my repertoire, I wanted to add on an iron condor. The iron condor is done by opening a put credit spread below the market and a call credit spread above the market. It's a neutral, defined risk strategy where you create a range between the strike of the short put and short call to be able to receive the maximum profit. The maximum profit that I can make on this iron condor is the $47.82 credit that I received to open the position. The maximum risk is the largest spread width, in this case they are the same, of $2.00 less the credit received. Therefore the maximum risk is $200 - $47.82 = $152.18. 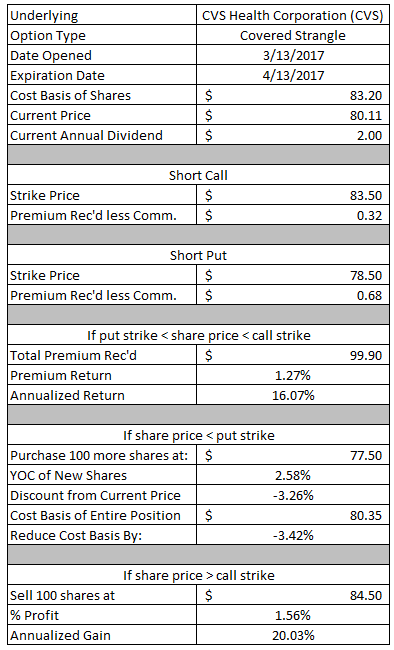 The maximum profit will be achieved is Union Pacific's share price remains between the strike price of the $102 short put and the $109 short call. At the time the position was opened Union Pacific was trading around $106. In that scenario all 4 contracts would expire out of the money and the full option premium would be profit. The $47.82 in premium would be a 23.9% return based on the $2.00 ($200) width of the spreads. The maximum loss will occur if Union Pacific's share price falls below the $100 long put or rises above the $111 long call. In that case I would lose the $200 less the $47.82 credit or $152.18. Going back to delta's as a probability gauge the short $102 put's delta was -0.178 and the short $109 call's delta was 0.2147. This puts the probability of Union Pacific falling between the two strikes at 1 - (0.178 + 0.2147) = .6073 = 61%. March has been relatively slow in terms of generating option profits partially due to having to roll some contracts into April and also just not having a lot of positions on with March expiration dates. The last two weeks of March might allow me to start closing out some of my April positions, but I don't expect to break $1k in option profits for the month. 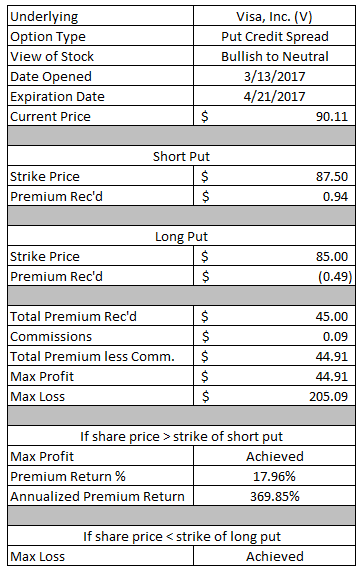 Thus far in March I've collected $676.94 in option premium profits and YTD I've generated $3,834.06 in option income. I haven't done one of those in YEARS. Haha. Hope it works out for you. Fancy stuff! This is my first iron condor trade to put on. We'll see how it goes, but the thought behind it was to set up a risk defined option play that encompassed where my short put on UNP was in order collect more credit and move my breakeven down in the event the short put is ITM. Should be fun to see how it goes.